A vibrant future for Los Angeles depends on each of us, together. We look forward to seeing you on October 3rd. Register here. Shane Murphy Goldsmith is the President and CEO of the unique and much-admired Liberty Hill Foundation, an important engine behind local organizations and small nonprofits that are reshaping Los Angeles through myriad battles for social justice and community empowerment. Shane also sits on the Los Angeles Board of Police Commissioners, and she is the co-chair of the California Executive Alliance for Boys and Men of Color SoCal Region. Shane is a Durfee Foundation Stanton Fellow focusing on youth justice issues, particularly on ending youth incarceration as we know it in Los Angeles. She served as a senior advisor to then-City Council President Eric Garcetti, overseeing housing, economic development, the city budget, public safety and LGBTQ issues. Shane has also worked as a community organizer focusing on economic justice in low-income communities of color in LA. A graduate of Kenyon College, Shane spent a year as a National Hunger Fellow managing a homeless shelter in Indiana and then conducting federal policy research on welfare reform in Washington, D.C. Shane has a Master's degree in Public Policy and Administration. She lives in Los Angeles with her wife Monica Granados and their two children. Shane sat down with our founder, Donna Bojarsky, in the wake of Los Angeles Police Chief Charles Beck’s retirement announcement. Beck’s news sounded like a good place to start their conversation. To sum up the counter-argument, Los Angeles is simply a big modern place, with lots of people, and big 21st Century problems that are desperate to be addressed. Unfortunately, in the recent years it seems as though civic leadership in L.A. has either abdicated its duty to solve many of these problems, or has offered uninspiring platitudes as excuses for being unable to do so. Take, to cite one example, the recent turmoil over the Los Angeles Times. Until local billionaire Patrick Soon-Shiong suddenly bought up the paper earlier this month, Mayor Eric Garcetti hardly raised a peep about the scandalous manner in which out-of-touch and out-of-town owners treated the LAT journalists in the past six months. Not much at all from members of the City Council, or from top labor leaders, top non-profit leaders, or from the admittedly dwindling ranks of L.A.’s corporate suite class. No one in a position to make any kind of civically influential statement on the matter took pause, and asked: Like the paper or not, what does a smaller L.A. Times mean for Los Angeles at large? Tamika Butler had just completed a successful three-year run as Executive Director of the Los Angeles County Bicycle Coalition (LACBC) in July 2017 when she sat down for a conversation with our founder, Donna Bojarsky for this dynamic interview. Butler’s candor and courage on many of the major issues facing Los Angeles – especially the impact of race and the city’s legacy of segregation – makes this a thrilling read for everyone who supports Future of Cities: Los Angeles. She has emerged as an exemplary Los Angeles civic leader, with the vision to see how the needs of her constituents for the basic right to transportation access, road safety and healthy recreation intersected with broader issues of poverty and discrimination against communities of color. Butler now serves as the Executive Director of the Los Angeles Neighborhood Land Trust, a non-profit organization that addresses social and racial equity, and wellness, by building parks and gardens in park-poor communities across greater Los Angeles. She has a diverse background in law, community organizing, communications, and nonprofit leadership. Prior to leading LACBC, Tamika Butler was the Director of Social Change Strategies at Liberty Hill Foundation, and worked at Young Invincibles as the California Director. She transitioned to policy work after litigating for three years as a public interest employment lawyer at Legal Aid at Work (previously Legal Aid Society-Employment Law Center). Tamika Butler received her J.D. in 2009 from Stanford Law School, and in 2006 received her B.A. in Psychology and B.S. in Sociology at Creighton University in her hometown of Omaha, Nebraska. Donna Bojarsky: When did you know you were going to do change agent work -- like not a doctor, or a lawyer, or a television producer -- but to work at making things better for as many people as possible? Tamika Butler: I feel like growing up I was raised with a lot of strong black women in my life, and very much raised that if someone's not speaking up, you should be the person who speaks up. I think I was always that kid. I also got good grades, so my parents told me I had to go to law school or med school. I don't like blood, so I went to law school. I was one of those people who wrote an entrance essay about wanting to help people and wanting to give back. It's interesting because when you go to a place like Stanford for law school, and there are plenty of job opportunities, and you're from a family where no one's ever had the capacity to make that money, and I'm making more in a summer than my sister is all year as a first grade teacher back in Nebraska where I'm from. I think it's really easy to get seduced into that corporate law world. But I worked at law firms over the summer to help send money home. I think those summers, I always knew. I think I did well because there was no pressure because I was never going to work there. I think that was the first time I was cognizant of it where my classmates were like, "Oh, I have to do really well on this memo," or, "I have to get a job." My best friend in law school went to Skadden's New York office as a first-year associate, and I was one of the lucky folks chosen to get a Skadden Fellowship. He's making $160,000 a year. I'm making -- not that. I think it never mattered to me. It was never about the money. It was, "This is what I went to law school to do. This is what I was raised to do." I think that was the first time I had to actually choose. Even then, it didn't really feel like a choice. It just felt like, "Oh, of course. This is what I'm going to do." The Olympics are coming to Los Angeles, but 2028 is a long way away. Can Los Angeles rise to meet the incredible challenges that face us before the world comes to visit? Will we be able to game the Olympics into another successful civic venture? Or will we be saddled with Olympian ruins and debt like Rio and Athens? Renata Simril is the President and CEO of the LA84 Foundation an organization that sprouted from the success of the 1984 Olympic Games that has supported thousands of Southern California youth sports organizations through grant making, training coaches, commissioning research, convening conferences and acting as a national thought leader on important youth sports issues. She is also a third generation Angeleno who has worked with the LA Times, The Dodgers foundation, and even served as Deputy Mayor for Economic Development and Housing in the Hahn Administration. Most recently, however, she was a key member of the 2028 Olympic Bid Committee and had a direct hand in the complex process of turning Los Angeles’ Olympic dream into a reality. Future of Cities L.A. is a civic initiative and project of Community Partners that aims to reinvigorate the involvement of civic leaders in creating a vibrant, cutting edge future for Los Angeles. As part of of our mission, FOCLA founder Donna Bojarsky, sat down with Ms. Simril to discuss the bid, the future of Los Angeles, homelessness, gentrification, and of course, the Olympic Games. Our founder, Donna Bojarsky, sat down with Nick Goldberg of the LA Times, to discuss the incredibly popular and controversial editorial series “Our Dishonest President”, the role of a large city newspaper in shaping civic leadership, and why the East Coast may finally be warming up to California leadership in the age of Trump. What was the trigger for the series and why? How did it evolve? Well, like every other newspaper editorial page in the country we’ve been writing about Trump non-stop. We started writing about him at the beginning of the campaign and we wrote a very negative piece about him early on saying he was unfit to be President and we were scathing about him when we endorsed Hillary. After the election, we were still writing day in and day out about him, but we were writing mostly one-offs, in which we would respond to an executive order, or to a cabinet appointment or to a particular tweet. At some point we just said, we have to pull this together, we have to write a big coherent overview, connecting the dots, about what we think about this bizarre new president, because people out there seem to want to hear it. And they did. Did you want the whole to be bigger than the sum of the parts? Yes, exactly. Well, you know, we wanted to pull it together and sort of explain to ourselves and to our readers, what it was we were seeing in Trump, and why it was that we were so upset and disturbed and frightened by this guy. What was it about him that was different from other Republican presidents, and from other people with whom we disagreed on policy issues. Future of Cities is curating a high-powered event at CAA in February called ARCHITECT. Our very special guests will be announced shortly. And introducing the first of its kind - CIVIC DISH. A one of a kind event, that is 1 Night with 20 concurrent dinners and focused conversations on the challenges facing our cities. Frank Gehry project causing a stir on Sunset Boulevard. Los Angeles helped fulfill your dreams. What will you do to fulfill LA's dreams? Restauranteur and health advocate Bill Chait, who is championing healthy food and a healthy workforce. Media and civic leader Monica Lozano, who is working to expand Latino civic participation. The Advancement Project's John Kim, who won't stop until LA is caring, inclusive and just. KCRW's Madeleine Brand, who is moving LA's big questions from drive time to prime time. LACMA's Michael Govan, who is reimagining the place of art in LA. Together, Bill, Monica, John, Madeleine, Michael and you can envision the LA we never imagined but always thought possible. Stay tuned...more civic leader participants will be revealed soon. A vibrant future for Los Angeles depends on each of us, together. We look forward to seeing you on October 19th. Save the Date: Oct. 19, 2015 Future of Cities! It’s time to call on you and all of LA's leaders to use your talents to enrich our city's civic tapestry so that all citizens may thrive. Los Angeles is a global capital of innovation and creativity, and its influence reverberates far beyond the city limits. We can leverage that influence to become a beacon of civic engagement and stewardship that can change LA and other cities around the world. LA helped fulfill your dreams, what will you do to fulfill LA's dream? Join us at Future of Cities: Leading in LA on October 19, 2015, at LACMA for a great LA Conversation that will help set the stage for change and strengthen our social fabric. We start with a special pre-reception featuring a visual exhibit of LA’s neighborhoods, bespoke LA Maps from MIT Media Lab, and a display from LAEDC Innovation week.The evening itself will be a dynamic mix of storytelling, provocative interviews, and cross sector conversations about some of our most vexing issues. The event will also include a special LA River presentation by KCET, a panel hosted by KCRW's Madeleine Brand in the spirit of her popular Making LA radio series, and LA notables announcing their favorite Civic Inventors. If you haven't already, please register your interest to receive an invitation here. Future of Cities Inspires a New Radio Show in LA! 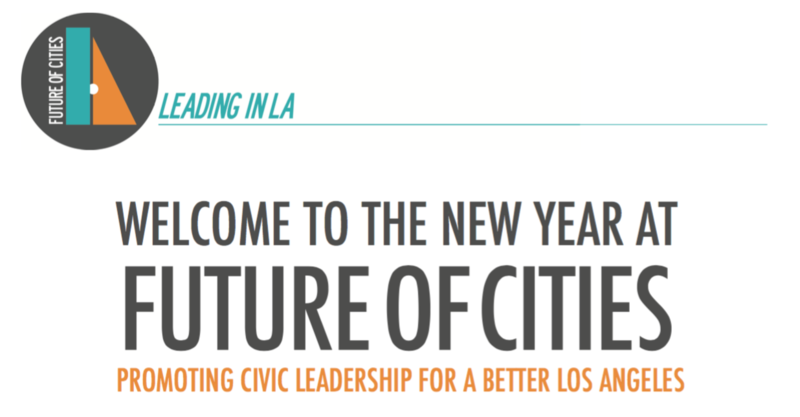 Future of Cities: Leading in LA launched on June 2nd, bringing together more than 100 local innovators to begin a course-changing conversation about civic leadership for Los Angeles. LA is a world-class city on the verge of major changes, and we convened many of the people leading the way. The event began the dialogue about change and leadership for LA that will continue online and through our October 19 event. Co- founder Donna Bojarsky announced the organization's anticipated programming focused on civic leadership, women, entertainment, design, and technology. We are very excited to see that Future of Cities is already having an impact! KCRW, one of our valued sponsors, has just launched a new series with Madeleine Brand called Making L.A. The show features conversations with local experts in art, architecture, the environment and governance to explore what LA needs to make it better, to move it forward, and to make it the place we all want it to be. Future of Cities is honored that among the people who attended and are committed to our initiative are Moby; the Director of LACMA, Michael Govan; architect Mia Lehrer; Los Angeles Magazine’s Mary Melton; our first Korean-American LA City Councilman David Ryu; LA Times architecture critic, Christopher Hawthorne; KCRW’s Jennifer Ferro, CicLAvia co-founder Aaron Paley, co-founder of the tech developer community Sabio.la, Gregorio Rojas; and many others. Our new civic endeavor will feature smaller salons to further our discussions about next steps for actions and creating some of the new structures we mentioned, including Municipal Art Society West, our online menu of LA leaders projects, and a surprise social media campaign. And at our first major public event in October, 2015, we'll bring together a cross section of accomplished civic, business, philanthropic, cultural and community leaders to ignite civic leadership in LA. Be sure to check out our website, and join us on Facebook, Twitter and Instagram for daily updates.